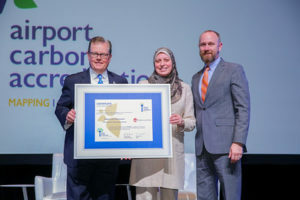 Not only is Dallas Love Field committed to providing high-quality service to the roughly 15 million passengers who pass through its doors every year, the airport is also committed to promoting environmental sustainability. As such, the Department of Aviation (DOA) strives to conserve natural resources through carbon emissions reduction. 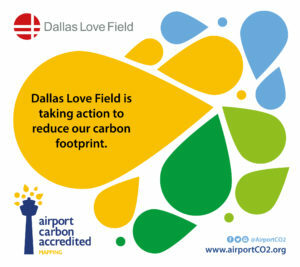 This November, Airports Council International (ACI) and Airport Carbon Accreditation (ACA) announced that Dallas Love Field earned Level 2 Airport Carbon Accreditation due to the airport’s efforts to reduce its carbon footprint. ACA is the only institutionally endorsed, global carbon management certification program for airports. The ACA independently assesses and recognizes the efforts of airports to manage and reduce their carbon emissions through four levels of certification: Mapping, Reduction, Optimization, and Neutrality. In 2017, Dallas Love Field was awarded Level 1 certification for collecting data on the airport’s Scope 1 and 2 emissions sources. In addition, the DOA has committed to reduce greenhouse gas emissions to 10 percent below 2015 levels per enplaned passenger by 2025. Love Field earned Level 2 ACA accreditation by reducing its carbon emissions in 2017 compared to the average 2015 and 2016 emissions levels. In addition, the DOA developed a comprehensive Carbon Management Plan that outlines the DOA’s efforts to reduce greenhouse gas emissions and identifies how future emissions will be reduced. ACA, ACI, carbon, Dallas, Love Field. Bookmark.